Unlike every tablet that looks like every other tablet that looks like an iPad, Microsoft's Courier was bold, imaginative and different. Of course, it got killed and was never released. But the spirit is still alive! The Courier's dual pane versatility lives on with Tapose. 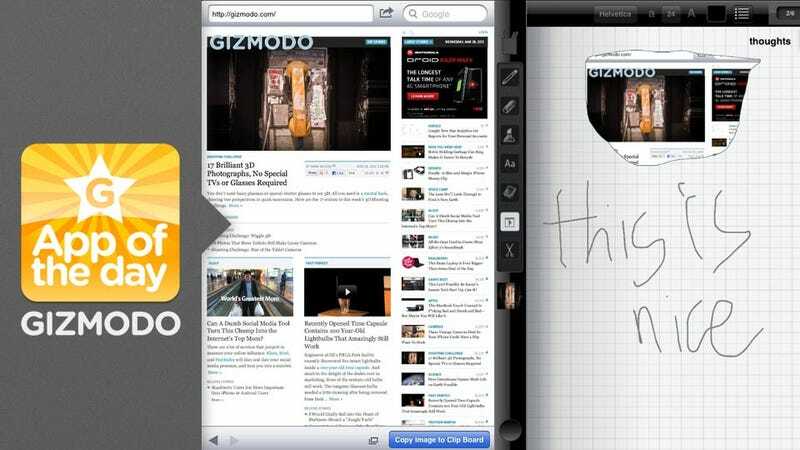 On the surface, Tapose is a web-clipping, journal jotting app. But the coolest thing about Tapose is that it lets you split your iPad screen into two separate, usable screens. Tapose has a Slide Bar that allows one app to be shown on one side of the bar and another app to be shown on the other. True multitasking! Tapose can let you open Safari, Maps, Contacts, Calculator and a Journal (which lets you jot things down). The tools, though simple, are useful too: pen, highlighter, eraser, text, sticky notes, a lasso tool (to grab custom images on the web, for example) and more. Basically, Tapose is a notepad app, a notepad app that lets you really multitask. There are some issues with Tapose right now but what we love about Tapose is the idea that motivated it. It's different, it gives you options on how to use your iPad and after using it, you don't want those options to ever go away. You don't want to only do one thing at a time anymore, you want to be able to use the space as much as you want. But Tapose makes us sad for the Courier, Tapose on the iPad, though fresh and interesting and exciting, kind of, sort of feels a little bit neutered and will always make us wonder what if.